This bracelet is flat out fantasy. It's got the necessary elements for many a story---the fate of the planet rests in the crown of the prince or princess, the crown jewels, too; there's earth, water and sky; a beautiful swan, and a mischievous gargoyle. It took me several tries to get this bracelet right, though, so that it looked good on my wrist. That's not so much of a problem with symmetric or color-themed bracelets, but with an assymetric storyline bracelet? and at the inside of the wrist at the base of the thumb. That's what I see when driving! 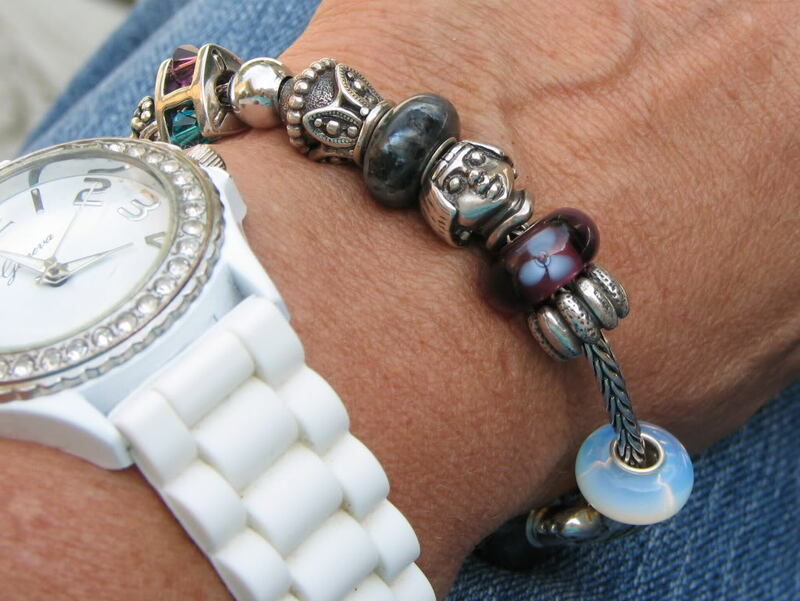 Beads that sit sideways on a bracelet actually work rather well for that angle. Trollbeads Dichroic Flower Lock and TB chain; Personality/Tedora Sideways Heart Stopper, retired; Blue Sodalite bead from pixiebeadcharms; "Moonstone" large-core inexpensive bead from ebay; TB Art Deco; TB Winter jewels; plain ball from Belk's department store; TB Planet; TB Little Princess two-part bead (but he looks like a prince to me); in the crown, smooth Labradorite large-core inexpensive bead from ebay; TB Purple Flower; Personality/Tedora ribbed stopper; Opalite stone bead from pixiebeadcharms; TB Spacer; Personality/Tedora Swan; TB Spacer; Blue sodalite bead from pixiebeadcharms; Green Opal bead from pixiebeadcharms; Zable Gargoyle, discontinued. I need to go look up moonstone, opalite, and chalcedony----maybe it's just different names for the same stone, or related stones? Edit: Nope, they're different things. But I'm not the only one who gets confused! Names for minerals and glass simulants often overlap, and there are so many stones coming out of China and India now that it's sometimes a translation problem. Plus so many stones are artifically enhanced. Moonstone comes in various colours, but the classic, most desirable moonstones are blue. I would not be surprised if this "moonstone" bead is actually opalite glass, my two beads look so much alike. Chalcedony has a glow to it, but not the fire. Great beads together! I do like the princess/prince!! A TB gargoyle would rock my world! 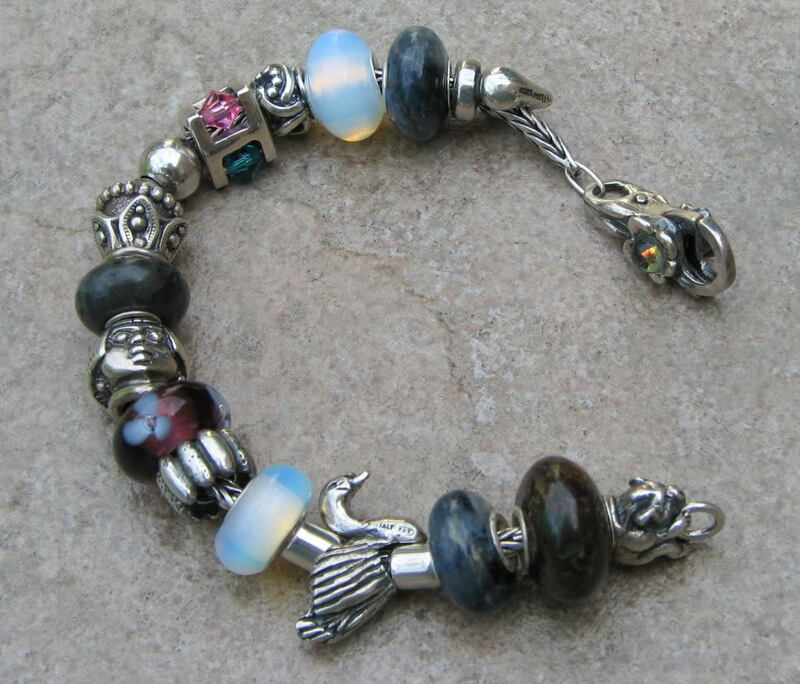 I like all fantasy themed bracelets! I'd love a TB gargoyle, too. 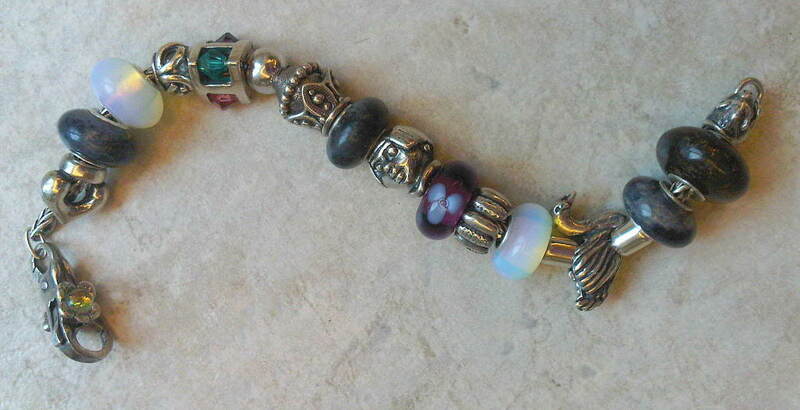 I looked a long time for a gargoyle bead, and barely found this Zable one in time. Fiery Mask makes a gargoyle bead, too. I did get that one, but haven't used it yet. It looks more like an alien creature than a gargoyle from medieval Europe. A great way to wear your planet in the crown. Terrific story bracelet! What a cool idea. that's what jewelry is meant to be (at least for me)... expressing someones creativity. Great bracelet!! Opalite beads are the best for me! And the story bracelet is very very nice! It's one of the things that attracted me to Trollbeads over other brands, the chance to play with characters and symbols. I love when the beads tell a story. You give us the elements but it's somewhat open-ended so that we can add to the story if we so desire. 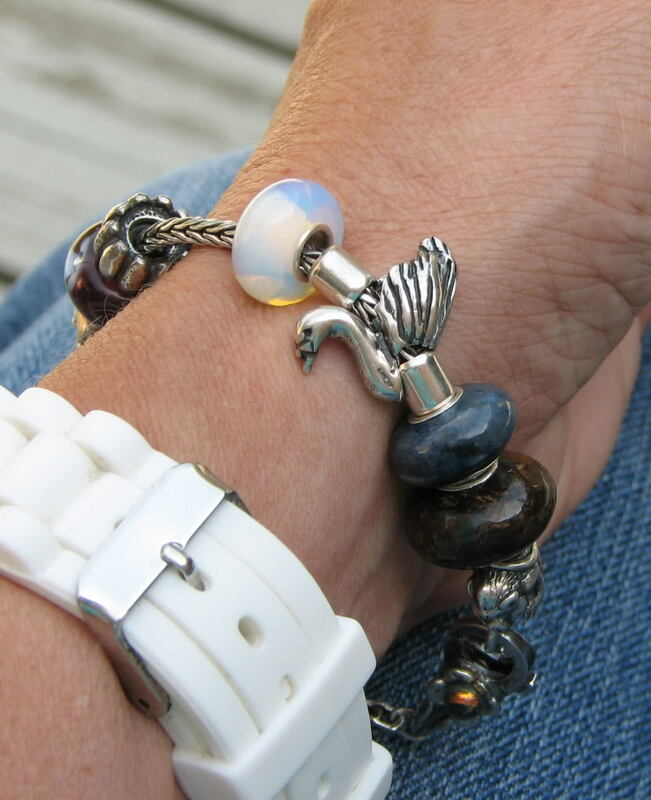 A bead bracelet could be a great story starter in a classroom. Wow! Thanks for linking me to this!! I love it!!!! @kitsunegrl wrote: A TB gargoyle would rock my world! LJ, Looking at the combo again. I need that swan. Have you added anything to the combo?? Stunning, omg, this is really perfect, and the swan.... serious troll envy here... well done! @Carla wrote: LJ, Looking at the combo again. I need that swan. Have you added anything to the combo?? No, Carla, I've not added anything to it. It's a fairly snug fit as is.